Companies have been telling stories in the name of selling products for decades (the old radio soap operas sponsored by laundry detergent companies are an early example). But nowadays, the rapid growth in content marketing has further blurred the lines between content and commerce. Brands can now create and publish "sponsored content" or "sponsored stories" everywhere from Huffington Post to TheAtlantic.com, sometimes sparking controversy in the process. While this new paradigm is likely to evolve, we don't expect to see it disappear anytime soon. With that in mind, here's a look at strategies for creating ethical content without misleading, disappointing, or otherwise frustrating readers. How do you horrify a tough editor? Just let him know that an inviolate grammar rule no longer matters. When the Associated Press told editors at the American Copy Editors Society conference that it was removing the distinction between "more than" and "over" from its style guidelines, there was an audible gasp in the room. Change. We can't seem to stop it. We're in the midst of the greatest disruption in communication since the invention of the printing press, however, and the style book isn't all that's changing. As Pew reports in its latest State of the Media report, thousands of traditional journalists are migrating to digital news outlets. As they do, they're going to need to acquire new skills that enable their stories to thrive in the digital world. Google is making a big bet on mobile app marketing, judging by the new and improved AdWords features it announced recently. Innovative new ad formats are designed to drive greater engagement, allow for more effective app promotion, and boost measurement capabilities for companies offering their audience a mobile app. The updates are likely motivated by rapidly increasing app usage, which is stealing from Web-usage time, and Google's need to shore up Google Play, which made just 13% as much revenues compared to Apple in 2013. Here are the highlights from the recently announced Google AdWords updates. Half of Americans (50%) who are aware of advertising don't trust what they see, read and hear in advertisements. 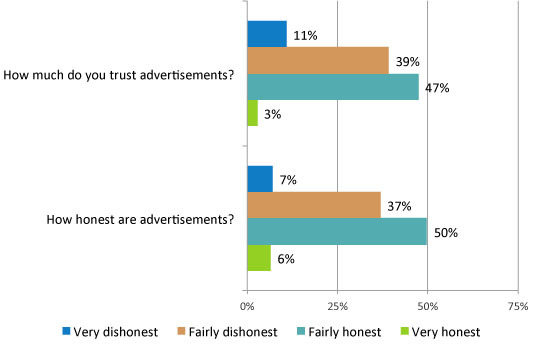 44% think that advertisements are dishonest. A clear majority (58%) thinks that there should be stronger requirements for proving claims in advertising. Trust in advertising is very much dependent on education. 65% of post grads think advertising cannot be trusted compared to 44% of those with a high school education. 35-54 year olds (58%) are more likely to trust advertising than 18-34 year olds and 55+ (48% of both groups think advertising can be trusted). Hidden persuaders influence what products are bought and how customers rate the shopping experience. They include aromas that increase spending, music that boosts profits, colors that enhance sales, and font choices that can make or break a purchase. This article discusses how they work--and how you can make them work for you. From music streaming services to magazine mobile apps, the last few years have brought us an array of options when it comes to choosing a message's medium. New platforms, like Vine, have even reinvented publishing categories -- which, in theory, sounds great. However, with more options comes more responsibility for brands. Marketers can no longer expect a clever radio tagline to reach the highly coveted Millennial -- Millennials have moved on from traditional radio. Essentially, this change has not only encouraged brands to reevaluate their medium of choice, but it has created an industry-wide discussion on the importance of tailoring each message to each medium.